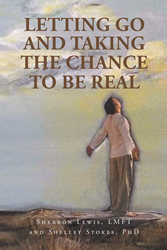 New book “Letting Go and Taking the Chance to be Real” from Sherron Lewis, LMFT and Shelley Stokes, Ph.D. is about finding one’s real self despite fears, present or past. Recent release “Letting Go and Taking the Chance to be Real” from Page Publishing authors Sherron Lewis, LMFT and Shelley Stokes, Ph.D., is about expressing the real self and living more fully and consciously within one’s potential, which takes courage and involves capacities for closeness, intimacy, creativity, self-soothing, and repair. Sherron Lewis, LMFT, a licensed family and individual therapist and Shelley Stokes, a clinical psychologist and former professor and administrator, offer their new book “Letting Go and Taking the Chance to be Real”: a work that inspires self-exploration by exploring the processes involved in becoming real once again or perhaps for the first time. Stokes and Lewis ask, “Who are we really? They suggest that the image we have of our “self” is derived largely from our experiences of who we are, from who we would like to be, and from who we are told we are by others. It is a sense we have of ourselves that is composed of various images which we strive to integrate over time that begins to develop in early childhood and grows (or is stunted) through experimenting and testing in early relationships and later relationships in life. It is that core “someone” who longs to be heard but who we often suppress for fear of ridicule, or fear of failure and loss of support. Published by New York City-based Page Publishing, Sherron Lewis’s and Shelley Stokes’s inspirational work explains that the lack of active support to express the “real-self”, especially in early years of childhood, can later lead adults to feeling unsatisfied, frustrated, and neglected--trying “so hard to be all things to all people,” “doing what is expected or required”—and no longer being sure of who they truly are or what is personally meaningful. To express our real feelings and needs takes courage and requires a healthy sense of self-esteem, agency, and capacities for intimacy, creativity, self-soothing, and repair. Because many people are afraid to take the chance, they may continue to live within a false self—behind a mask. Readers who wish to experience this inspiring work can purchase“Letting Go and Taking the Chance to be Real” at bookstores everywhere, or online at the Apple iTunes store, Amazon, Kobo, Google Play or Barnes and Noble.